As women we can find ourselves feeling distressed by the extreme divisions and oppositions we are witnessing locally, nationally and globally. We may find these disparities echoed internally which give way to confusion and uncertainty. Our challenge is to reconnect to the Common Heart of the Feminine that naturally provides grounding and relationship from a place of strength, balance and deep knowing. Join an exceptional gathering of women in a welcoming landscape of hill country traversed by rocky creeks and tall pines as we restore ourselves by rediscovering the gifts that the Feminine brings to the world in this time of divergence and disconnection. 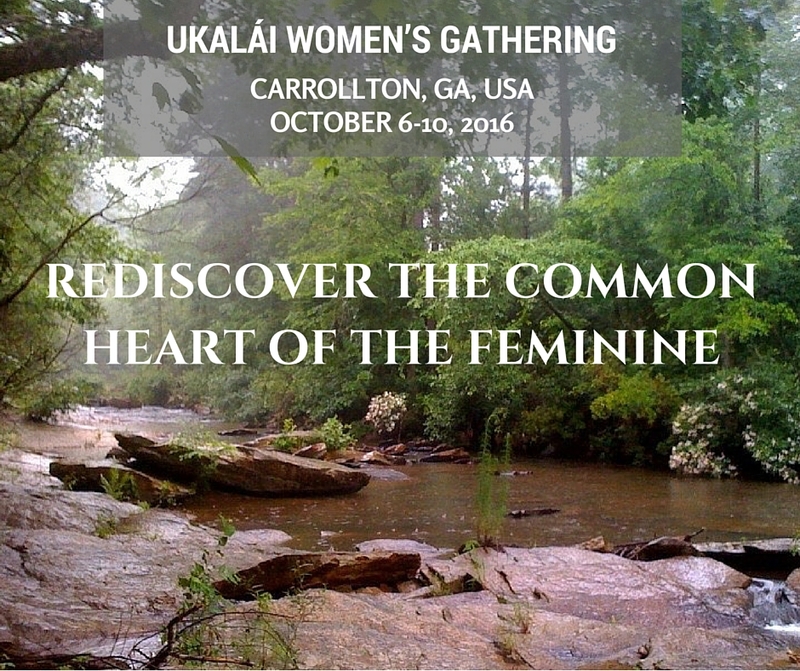 The gathering is facilitated by Sherry Boatright a Quiatizques (woman bringer of rain or weather shaman) in the Nahuatl tradition of the central highlands of Mexico. She is also a psychotherapist experienced in leading women’s groups, a ceremonial leader and a Sacred Fire Community Firekeeper. For full details on this event please inquire below. In this issue of ATF, I’d like to bring more visibility to the structure and the people behind what we call the Sacred Fire Community Organization. But first, I want to share some of the highlights of what’s been going recently in the Sacred Fire world. Since we last spoke, we’ve had two Grandfather Fires in California — one in Santa Monica and one at Mt Tamalpaïs, our annual Fire in the United Kingdom, the first ever Grandfather Fire in Olympia, Washington and the historic Story of Tobacco Fire in Pennsylvania. 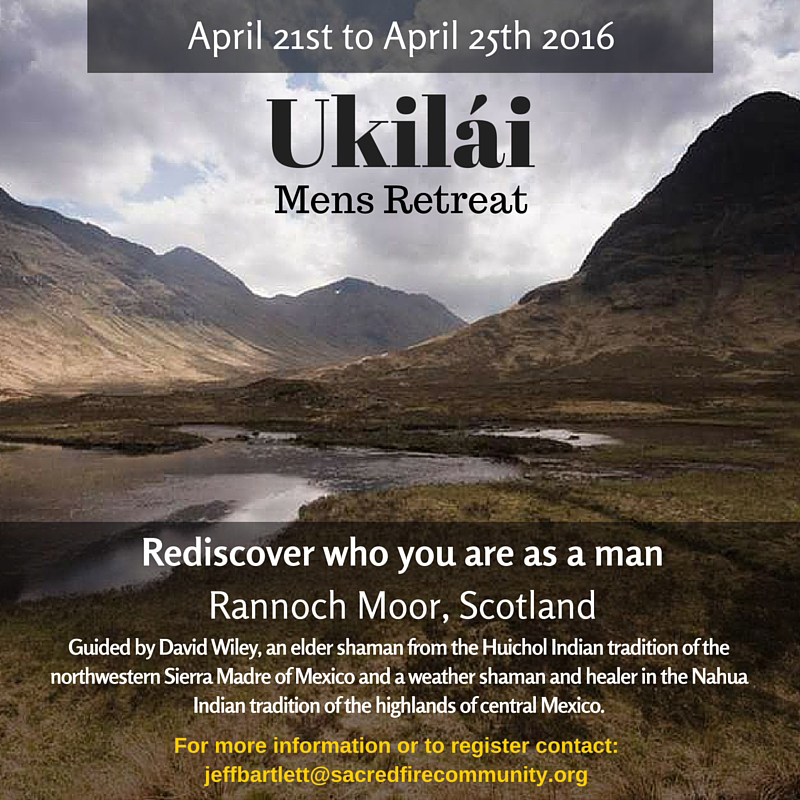 In April, David Wiley held an exploratory Ukilaí Men’s Retreat in Kinnloch Rannoch, Scotland, next to the sacred mountain Shehalian, referred to as “the center of gravity.” In October, Sherry will be holding an Ukalai Women’s Retreat in Carrollton, Georgia. Sherry and Annie King also just led our first training for holders of Women’s fires. We look forward to holding a similar training for holders of Men’s fires in the near future. 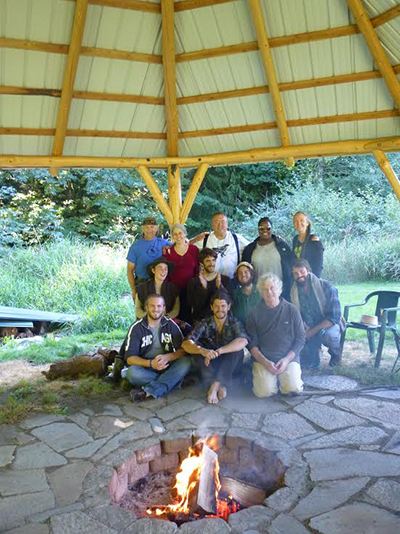 In May I relished an opportunity to “jump into the fire” with the firekeepers at the Dancing with Emotions workshop outside of Olympia, Washington. Dancing with Emotions is one of the core elements of our continuing firekeeper training, which was developed in collaboration with senior trainers from the Global Process Institute. In our recent Dancing with Emotions training in the UK, we opened the first two days to the public, followed by a deeper one-day dive for firekeepers. We hope to repeat this format soon in the United States and Australia as well. Voices of Wisdom, a program of the Sacred Fire Foundation that brings indigenous elders to speak at local Sacred Fire Community hamlets, just completed two very successful programs in Asheville, North Carolina, and at the Blue Deer Center featuring Mohawk elder Diane Longboat, Dakota elder Wanbdi Wakita and Oglala Lakota elder Charlene O’Rourke. They are currently planning another Voices of Wisdom in Toronto for the Fall. With the news brief out of the way, here’s the meat of what I’d like to talk about this issue. So what is it you are the Executive Director of and what does it have to do with me? I’ve heard that some people feel in the dark about what’s been going on with the community organization, and even as I write this, I’m aware that some of you are probably asking, “What community organization?” For the benefit of both newcomers to the community and for those who’ve been around a while, I’d like to provide a brief overview or what we are and what we’re currently up to. I’ll do my best to keep this short so it remains bite-sized, enjoyable reading. So why do we need a community organization? The fires and the community arose so organically. Isn’t creating some kind of formal structure just bowing to the corporate paradigm? Grandfather has a big vision — I mean really big — for us to bring needed help to the world, and there are certain things that simply cannot be done at the local level. To fulfill His vision, we need to have a clear articulation of what we are saying and how we appear to the world, a training for firekeepers, general guidelines for community boundaries, programs to help people understand more deeply what we’re about, and a way of dealing with the legal and financial world. There are certain things that we all benefit from when they are done once on behalf of everyone. And there are certain realities we have to deal with in the modern world that can only be addressed by our being an established, reputable nonprofit organization. So you might be saying, “Okay. That makes sense. But do we have to become — gods forbid — ‘corporate’? Does this mean we’re implementing a “top down hierarchy” and all the bad things that come with that? As with anything in today’s world, there needs to be a legal structure to relate to the world at large. But this structure does not need to dictate how we define our internal realities. So we’ve developed a structure to work with the world and also a slightly different way of describing our structure for us to use internally that fits more in line with how WE wish to work with each other. Our structure is very simple. We have a Leadership Guidance Group composed of individuals who have the experience needed to provide good counsel at this stage of our growth, make good decisions and who have demonstrated deep commitment to the community. And we have a Community Service Team who coordinates and implements the various things we are doing in the world — such as training firekeepers, providing programs around Life Cycle Living, and promoting our presence in the world. In the outer, legal world, the Leadership Guidance Group is called the board of trustees, and the Community Service Team would be known as the operations team, or area heads — in our case, of Firekeeping, Lifeways, Outreach and Events. This group is overseen by the Executive Director, whose job is to hold the vision and responsibility of coordinating the various moving parts, and who reports to the Leadership Guidance Group. At this point you’re probably asking, “Yeah, but who are those people?” So here you go! David is the carrier of the map of where we’re going, and he has an amazing toolbox of organizational experience from his earlier days as a management consultant. He is being shared with us for a limited time by the Sacred Fire Foundation to help us get things going, and has helped us greatly in getting aligned with Grandfather’s vision for where we’re going. 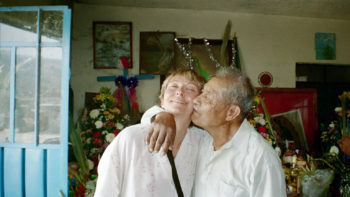 Susan has been with us as an executive director of the organization from the very start of the community organization. She is the protectress of the finances and the legal structure, and almost single handedly (with the help of lawyers and accountants) brought our nonprofit status into being. Karen was the inspiration behind the original community marketplace and worked to help raise the funds to buy the Blue Deer Center. She’s held a variety of professional fundraising positions, and brings a wealth of experience in nonprofit administration to the team. Roger has an earthy, hands-on approach to community development and knows what it means to bootstrap a business from nothing. He has a wise, loving vision for the community, and being Australian, brings a multinational perspective to our work. We have a phased strategy for getting the structure in place that Grandfather is guiding us to build. During this first phase of our work, we are focusing on 3 areas: Firekeeping, Lifeways, and Outreach. Because of the large number of public Grandfather Fires, we are also including a Central Events Coordinator in the service team. In the future, this will become more of a full-fledged department. For the past 30 years, I’ve worked as an administrator in Shambhala and in the communications and technology fields. Throughout my life, I’ve been very aware of the effect — both good and bad — that leaders, technology and communications can have on our world, and long to bring about a greater spirit of genuine community and connection to our people. Annie is our Fire Chief, providing nurturing leadership to the firekeepers and their education, and support for a variety of community issues that arise around the fire. Sherry oversees the rolling out of Lifeways, a series of programs, initiations and explorations related to what Grandfather has called Life Cycle Living. These programs provide a needed complement to the connection work we do at Fires, supporting our movement through our lives and our ability to tap into the gifts and work with the challenges of each phase of life. Dave oversees the communications work we do to let our community and the greater world know about Fire and our various offerings. This includes everything from program publicity to our web site, our Around the Fire newsletter and some other exciting things we’ll be rolling out shortly. Jeff oversees logistics for our events, including Grandfather Fires and other programs. This includes supporting the local hamlets with preparation and event execution, working with budgets and registration, and acting as a repository of shared learning. I’ll go deeper into people working for the community organization in a near future article. But next time, I plan to share some really exciting news with you about some things that have been in the works for some time. So please stay tuned. 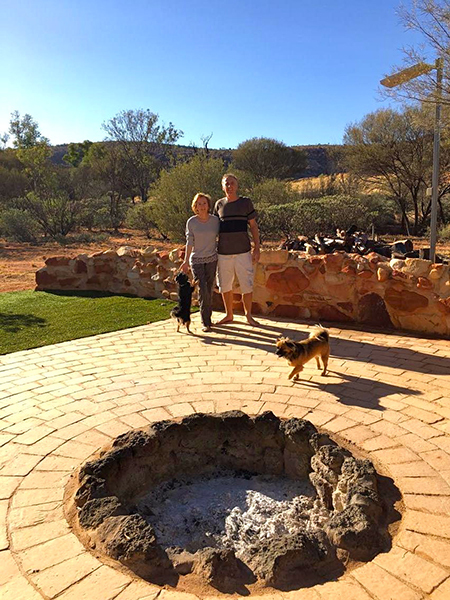 Around the Fire caught up with Roger and Reyna Menadue, SFC Firekeepers in Alice Springs, Australia in late March 2016. Fellow Firekeeper Christine Staub conducted the interview. CS: Hello Reyna and Roger. I’m so glad you have the time to talk with me today. It’s wonderful that, with these “Meet a Firekeeper” interviews, ATF readers have been introduced to firekeepers in the United States and the United Kingdom, and now here we are in Australia. It really shows the international presence of the Sacred Fire Community (SFC). I wonder if you could start off and tell us a little about the Land where your hearth is. Reyna: The country here is untouched desert; it has a very potent, wild feel to it that you can sense. Traveling through coastal parts of Australia there is a lot of agricultural country. But here it is quite untouched, “as it always was” and we are very fortunate to have a beautiful fire pit in a fairly secluded place just outside Alice Springs. CS: Can you share about the local flora and fauna, please? Roger: Our house faces north on to a mountain range. 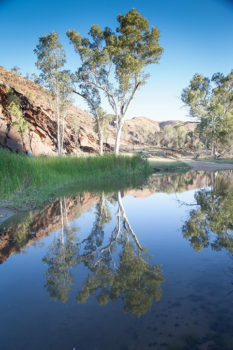 The range features importantly in the local indigenous creational story of an ancestral caterpillar. It runs East-West through the town and is a powerful songline for the Aranda people of this area. Kangaroos move through the backyard, foraging and looking for water. 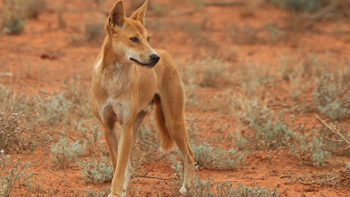 We also have wild dogs, called dingos (Canis lupus dingo), which walk through looking for rabbits and peoples’ chickens to eat (they often threaten pet dogs too, over territory, not food). 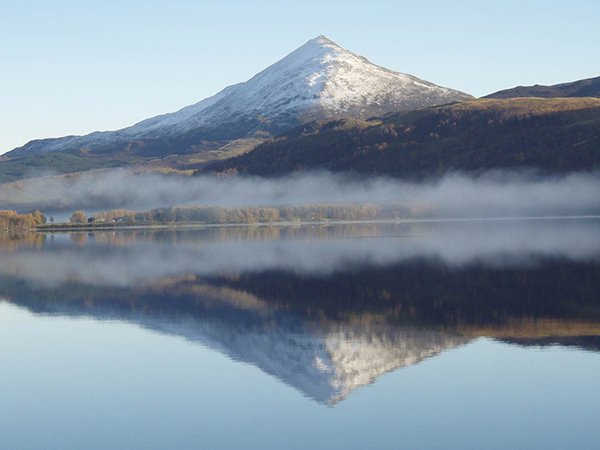 It is really the wilderness here – the untouched natural world, infused with 60,000 years of ritual custodianship, which we feel incredibly privileged to share. This Land still has an immense presence. 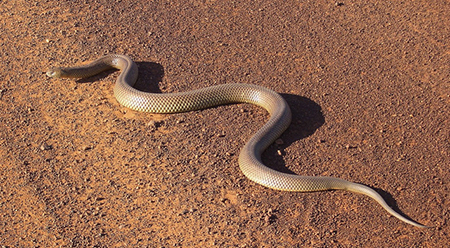 Reyna: Also, we have very venomous snakes, called Brown Snakes (Pseudechis australis) that we see periodically in the garden or indoors. We’ve come to live with them, saying our prayers and try not dwell on them too much! Roger: Temperatures can be very hot – for 6 months over 100° F (38° C) degrees, and now (in April) we are just coming into the cool months. It still is in the 80s, but we can sense a change coming. Winter is really beautiful here, with blue skies, not much wind and a clear, crisp atmosphere. With little to no pollution, the stars are extremely bright at night. Evenings in June/ July can get down to anywhere from 32° to 16° F (0° to -9° C). As the climate is dry, we don’t see snow. CS: What about the flora there? Roger: Acacia is predominant here. 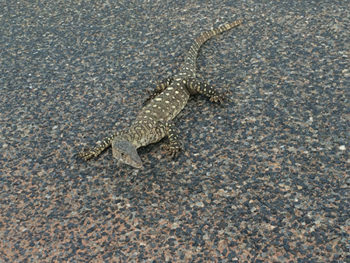 A common one is called Desert Mulga. This plant is very significant and is used by indigenous people to form hunting and digging implements. We also have a special eucalyptus tree called Ghost Gum. This has a bright, white trunk with hardly any imperfections on it and is very slow growing. Reyna: This is semi-arid land like in Arizona, and has the same types of small bushes. We have Witchitty bushes (Acacia kempeana) and edible grubs (larvae of the cossid moth Endoxyla leucomochla) are found in its roots. CS: Where you both from Australia originally? CS: And were you from this part of Australia? Roger: No, I was born in New South Wales (between Sydney and Melbourne), but I came up here in my early 20s, worked on a remote station / ranch for 2 ½ years, alongside indigenous people mustering cattle on horseback, which I loved, then returned with Reyna to settle here, in 1998. CS: How about you, Reyna? Reyna: I grew up in Sydney and then travelled for a few years, spending 5 years in India pursuing spiritual interests. We met Eliot in Mexico in 1997 after reading Plant Spirit Medicine. He was staying at Don Lupe’s house and we joined him there. Next, he invited us to participate as visitors at a pilgrimage site in California the following year. After this trip, he said we needed to move to central Australia, as our site was there. We were living in Sydney at that time. Reyna: Yes, that was our reason for moving here. Later, in 2003, we bought our block of land and built our home. CS: Wonderful. As you can tell from reading the previous “Meet a Firekeeper” articles, Eliot is not a small player in this. It seems Grandfather often uses him as the calling card or the lure because I am hard pressed to find many of us FKs who didn’t find our way to firework first through Eliot’s book, then next having the thought “I’ve got to go meet this man” and the rest is history, right? Reyna: Well, I had spent a lot of time in India and fire ritual is everywhere there. I remember fire ceremonies I attended where 40 Brahmin priests chanted 10 hours a day for a week. The energy of Fire was really palpable – with offerings being made from their tradition (ghee, sesame seeds, essential oils etc.). I came to love Fire there. Roger: Reyna and I met in India in the mid 1980s and had a lot of fire connection attending long fire rituals called Yajnas. Further, where I grew up rurally, fires were common in peoples’ backyards. I was born on Guy Fawkes Night, so I remember there being big bonfires each birthday! Reyna: Our first GF Fire was in David’s house in Cuarnevaca in 2000, while I was heavily pregnant. That pretty much gave us the big picture and was definitely a game changer. CS: Wonderful. What was your experience (Roger)? Roger: We’d moved up here to Alice Springs by then. When I met Grandfather for the first time, I knew this was it. There was no doubt in my mind that I was going to do this work. I’d been around spiritual teachers and met some great beings…but this was entirely different. What I felt was that there was a meeting in such an accepting space. Grandfather essentially said, ‘with your warts and all, this is your job, and whatever you bring to it, it is fine.’ Notwithstanding, I also knew that at some point my rough edges were going to have to be broken through! But there was a humor, and an acceptance, and I felt that this was the type of atmosphere I would like to work in, that I could do this and that it suited my style of operating. Reyna: Yeah, that would go for me as well, actually. Then with firekeeping, in 2009 GF Fire gave an audience here, on one of his numerous visits since 2001, and He suggested we become firekeepers. I was doing some work with women and he wanted to ground that. Roger: GF asked me to become a Firekeeper at that audience too. Our initial and on-going training with FK Retreats and Dancing with Emotion, has been amazing too. Learning the facilitation approach to hold space – I have grown so much, and that stumbling and tripping over and bumping up against things is SO accepted. Even in my education it wasn’t quite like that. At the Fire, there is space for me to really explore and grow. CS: Wonderful. So you guys have actually been involved with some important work with Eliot and David for a really long time but you have not actually been SFC FKs for that long yet. Reyna: No… though we did have fires quite regularly after meeting Eliot. We lived in Sydney back then and we had fires on the little balcony of our apartment, in a wok resting on 3 bricks. Every month we’d light the fire because we could feel that connection with Grandfather. CS: Anything else you’d like to add? Reyna: Fires in Australia have had a particularly bad rap in recent years with mega fires and numerous fatalities creating great fear of fire. In the cities now, the permits required and the restrictions around holding fires are tight: a friend in Sydney was going to have a fire for some friends – the local council approved only a candle on a table outside, with a screen around it! Roger: One thing I’d like to add as a side note to firekeeping is around the whole idea of having a fire in this modern world today. When you light a fire and you have a natural environment around you – as we are fortunate to have here – that alone is potent and dynamic. Then people come and you sense this mystery that is magnificent and beautiful. Fire’s mystery is right there where our culture left and forgot it…ready to respond. CS: Who is being called to your Fires? What is the guest list that GF is creating and how are those people coming to you? Reyna: Mostly friends and then friends of friends, plus workmates. 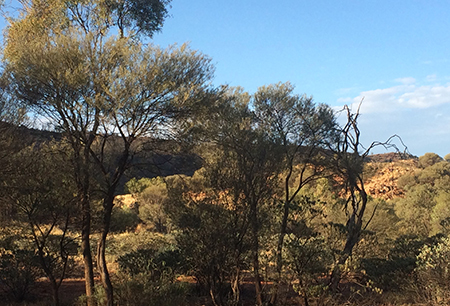 Alice Springs can be a transient place. As a small town (pop. 27,000) isolated in the vast center of the continent, with a significant indigenous presence, it’s a place that people want to experience. Over time we are attracting more locals, bringing depth and steadiness to the fires. CS: Are there children who come? Roger: Some parents have brought their children and they have slept around the fire. There is one lady who comes with her pre-teens; they hang around the garden for a bit and then come to the fire. I can see how as time goes on, that fire element and that natural setting will become such a unique place, because people don’t do that…you know sit out in the dark, around the fire and talk. Or they’ll do it…with a beer, but not actually in a sharing mode, not connecting with the fire as an energy of transformation and healing. CS: You say that so beautifully: it’s a perfect ad for the SFC. Reyna, you mentioned earlier that you have worked with women and maybe because of that GF invited you to become a FK. Can you say more about that? Reyna: Well, I was holding women’s fires related to our Walk project. When we were initiated as FKs, I started a monthly Women’s Fire in Alice Springs and it’s been going for these past six years. We meet monthly, and quarterly we have a sleepover around the fire – which people love actually – people bring food and their swags. Reyna: Swags are a roll-up, envelope type bed with a soft foam mattress inside. You add a sleeping bag and pillow and it’s pure bliss! Everyone who goes camping in central Australia takes one, as it rains so rarely. CS: Roger, are you doing any Men’s fires? Roger: We’ve done a few over the years. I’m finding it hard to keep people committed. About 3 years back we were having some success for quite a few months. Now some key guys have left to go back to the East coast. I’ve got one or two interested men at the moment so we’ve started to talk about having them again. Without me pushing too much, I want them to say, “We are ready, we are longing for it.” Not that I’m tired of it, but it might give it more regularity if they ask for it. Reyna: Over the last 6 years we have had quite a few Lifeways programs here, including the Relationship workshop, 3 Ukilai retreats and a Fire Keeper retreat with David Wiley, a Ukalai retreat with Sherry Boatright, and Prema Sheerin’s Peaceful Dying workshop. People flew in from all over Australia for these. Reyna: Yeah. With such a sparse population and everyone struggling financially, we’ve been through all the friends in our database and now we just don’t have the numbers to cover costs for the teachers to come out from U.S. We’ve put a lot of energy into it and offered whatever we could. CS: Well, I’m sure that each one of those events blessed, and put an additional layer of energetic on the land there where you live, which in its own way is a blessing. Is your hearth consecrated? CS: Yes, we’ve had people who came one time because sometimes they came from far away and were invited by someone. Each time they either left a strong (positive) impression on us, or vice versa. It was good enough. The medicine was delivered and on they go. It’s nice to have the core community, of course. CS: Is there anything else you would like to share? Roger: Several years ago I invited a friend of ours, an indigenous Ngangkari (shaman), to a GF Fire. He sat very quiet throughout the entire time listening to the conversations and interaction that were going on. At the end of the evening, I was eager to hear how it was for him. He said for almost the entire time that GF was talking he was staring into the fire pit, watching the old person that was in the fire, talking back to him. My friend didn’t seem surprised, as if this was what happens when the Spirit of Fire wants to pay a visit. Even though his English was basic, he said that he understood the discussions very well. Often when GF visits Australia he talks a lot about the ancestors of this land. For this man it all made perfect sense. Roger: I am also enjoying the role of a SFC Board member. We have a wonderful working team with Bill Sutton as the Board’s ED. CS: Great. Yes I know that Bill Sutton (SFC Executive Director) is preparing to start unveiling some of the new branding efforts. We are all on the same team, we want the same thing – to bring our people back to Fire. Thank you so much for your time today. Connecting with and deepening my relationship with fellow SFC members from around the world is one of the best parts of this assignment as ATF content editor. In April 2004, during a private audience with Grandfather Fire, Deanna Jenne was given a mission to gather others of like heart and to establish a community in which its members would model living from a balanced and mutual relationship with the Land, the natural world and each other. After a gestation period of dreaming and due diligence, the Mesa Life Project (MLP) sprouted in October 2006 with the purchase of land which sits on the Grand Mesa, the largest flat-top mountain in the world. Twelve years of learning and growing ensued. Throughout, the vision was held in a strong way and now a new phase of growth is at hand. ATF caught up with Deanne Jenne, who leads the MLP Council and Chris Schlake, MLP Communications Director, to find out what is happening on the Mesa. 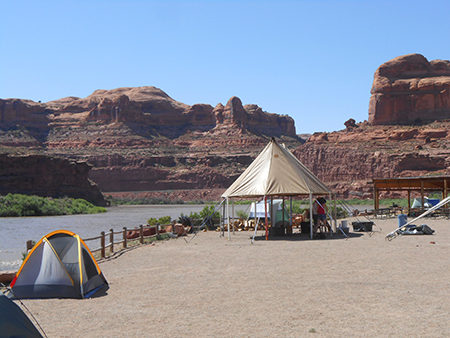 ATF: Many of the Sacred Fire Community (SFC) family who have been around for a while have heard about the Mesa Life Project, at least to know that it exists. Apparently there are now lots of new activities happening that you would like to let the world know about. Where shall we start? Chris: Like Ram Dass says in his memoir, we are “Still Here”! We’ve been at this for a while even if a lot of it seems to have been under the radar. We haven’t been passive or dormant; in fact we’ve been engaged in a whole wide range of tasks all this time. This has revolved around people, relationships, the ebb and flow of community life. This project has had it’s own timing and has been unfolding in ways different than we expected. But the fire is certainly still burning. ATF: It’s been almost ten years since you bought the land. You have had to be in a sort of holding pattern while dealing with legal issues related to easements and getting an environmental assessment study required by the Bureau of Land Management. What is the situation now? Deanna: We paid off the land, 80 acres, last year. The title company finally came through with the legal easement and the road in is being built as we speak. We are working with an architect who is doing the engineering drawings now for our first community house. We are meeting with a potential general contractor. We’ve met with solar designers and heat exchange designers, since we will be totally off the grid. As it turns out, it’ll take this summer to get the water and electricity infrastructure in place to build a house, so we are looking at summer 2017 for construction to start. The house will be built using time-tested, natural building methods that should allow it to stand strong for hundreds of years, maybe even 500. In my dreams, the next seven generations would live in this first house. ATF: You’ve had to exercise a lot of patience, as well as the courage to let go of expectations these many years, it would seem. Deanna: Well you know, in the beginning there was a honeymoon phase and we had 25 people interested. We were meeting weekly for a year but then when the dreaming time was over and we needed to take action to buy the land, most everybody decided they didn’t really have the money to join us. 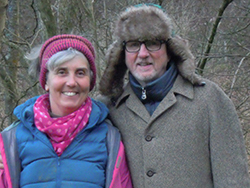 My husband Gary and I, after being on a very long walk on the land, got a message from Grandfather Fire later that night to “make a bold move”. I don’t know what we did, but Chris and his wife Paige committed (maybe we threatened to tie them up) and then other people got courageous, even some that we didn’t know, and we all really took a cliff jump. Chris: We now have a shared experience around the nature of trust. When people leave, it’s not only a loss that needs to be grieved, but it rattles trust. This has been a huge commitment to make together and we come to rely on our comrades. So when people leave, which of course happens, the trust that they will be in it to the end is shaken. But the process of building and re-building trust has been part of the project from the beginning. It has been a very serpentine process, not linear at all. When you think you are building something…some part of you wants it to be linear, from here to here to here and then boom, done. It’s not at all like that. There is a challenge and opportunity to trust a process that is not at all linear. It is flowing in a direction, just not in a straight line. Trust is also related to the bold moves we take. There have been these punctuated moments along the way that asked of us to take big leaps of faith, to trust there would be something on the other side to catch us. Deanna: Every time something has come up that shook us… in just staying with the process… another piece/part of the road would open up. For instance the next day the lawyer would call and say, “this part is good now”…over and over and over that happened. There is a lesson about stamina, which we have also learned in this waiting period. Our property is bordered by elk conservation easement. Recently Gary and I and Heidi, a recent addition to our community, were out on the land checking on the road construction. There was a herd of elk “in the house”, where it had been mapped out on the ground. They were lying down in a bedroom, eating grass in the kitchen. Elk are often seen as an animal with great stamina. We watch them climb the hill, the steepest part of the hill. They are so strong and witnessing that energy has given us the strength too, to withstand the losses and major sadnesses as several people have left, some quite recently. And once again there is this balance with the arrival of a very long awaited baby for Chris and his wife Paige. ATF: Will you have to have a conversation with the elk about choosing a different resting spot? Deanna: Well, besides the 275 acres that encircle us they have lots and lots of space. We are on an elk migration route. We really want to be good stewards of this place. We do a lot to honor the Land and the Beings here. There is an anecdote I want to share. Last week our solar energy designer Johnny walked on the land for the first time. I don’t know him that well but we had met when I was in the solar industry back in the 80s. So he came and he was looking around and he was in awe of the place. I could hear him whispering to himself, “This is such holy land. This is really a sacred place. This place carries the sky like no place.” I found myself sinking down and crying into the earth. That is how I feel about the Land. (At this point Deanna starts tearing up again). For people to say, “this isn’t my place”, it is hard for me to appreciate that, because I am so in love with this place and we’ve had so many ceremonies here. We always give offerings when we walk on the land and always ask for guidance and ask the spirits to teach us how to be on the land. Now people are feeling the resonance of that. For someone who is a stranger to this place to have that reaction like Johnny did…it spoke volumes of what we have been doing here. That is despite the fact that there was a road newly carved into the property. The sacredness is very palpable. ATF: So you have many things to celebrate right now: the elk, a new baby, moving forward with construction. What else? Chris: Celebration. It’s such an important part of this project. 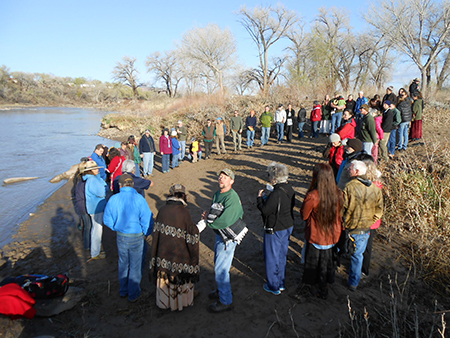 In fact, we have all these celebrations coming up: the River Gratitude ceremony, the Creation Story dance, the men’s trip to make Offerings to Father Sun, the baptism of our son. I wonder if we maybe don’t express this about our community as well as we could: a most important part of the project is how we really are about celebrating our belonging to the world, our embeddedness in the fabric of this world…. this is so obscured in our everyday life. I can tell one little story about this that may be germane. When Paige and I first moved back to Colorado, we lived in a traditional Mongolian yurt for almost 2 years (By the way, this is not going to be a community of yurts!) What we experienced living in that structure is that one is not barricaded from the natural world. It’s more like a permeable membrane – you hear the rain, you smell the rain, you hear/feel the wind, you are connected. We had this beautiful skylight in the middle – the sky was part of the room at all times. We lived profoundly connected with the world. In fact, this is a little aside – I just bumped into this very interesting book “Owning the Earth”. It is about the historical process that yielded this very anomalous and unprecedented fact of individual ownership. Before, ownership had always been collective. The way homes were built, involved one large room. As the privatization thing came into consciousness, people wanted private rooms for this and that activity, which is a symptom of what was and has been happening in the culture. Deanna: Our architect, she lives in Oregon, ran us through a visualization, so we could figure out how to build our first house, which would have a number of families in it. What I saw, it looked like a lot of people coming in and out and having lots of room for kids to even bunk up together in a room. There is to be spaciousness for people to gather; it just feels like a lot of people will be in and out of our community. You know, the housing piece is just one small part of the vision of our community. 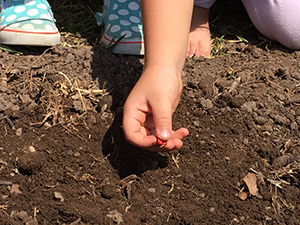 Right now it is our biggest focus because that is what we are doing right now but I think that it will be a place for both children and adults to learn about nature. It is very wild where we live; it’s very, very wild. The antidote is reconnecting with nature; from there we can reconnect with our hearts. I’m just remembering somebody reminding me about Grandfather coming in May 2014 to talk about the Story of the Colorado River. He said that this land, not just this land that we live on, but also this area, is land where people need to come to reconnect with their heart. I just feel with the way the world is we have a special place that is very unique. There are not many places like this left, and it will be a place where a lot of people will come seeking that connection again. Chris: If we are looking a couple of hundred of years into the future, what I see is people who KNOW that connection. What came up for me during the visualization Deanna mentioned earlier is that the people who will live here will know, without a doubt, that they belong. When I see the people on the land, in our buildings – these are people who know: that they belong to each other, to the Land, to the world. Maybe that is like a psychological slant on it, but that is what their inner life is. It is taken for granted. It is just a deep-seeded knowing of their belonging, particularly to each other. I think we are moving in that direction. It’s still kind of a novel experience, this sense that we really belong to each other. ATF: Is there anything else you would like our readers to know, now that construction of the first home is projected for 2017? Deanna: First off, anybody interested in what we are doing should feel free to reach out to us through our website, http://www.mesalifeproject.org/. We are looking for more members. In some ways, now when someone comes along and they are in alignment with our vision, then it may be easier to fall into it, like the 100th monkey effect. Chris: Although I think it can be hard in a different way, because it takes courage to jump onto an already moving train and to trust the process. I imagine it takes a particular quality of courage to be vulnerable, to allow one’s participation to be somewhat improvisational as one enters the mix of community without having all the lived history to share. Deanna: People should know that we are a demonstration project in that we are moving away from the old paradigm of ownership. For instance, no one will hold a personal deed to this house. Instead, we each own shares. ATF: Deanna, as the Head of the MLP Council (a position affiliated with the Spirit of Bear), do you feel confident that at this point, if you had to take the training wheels off and you would no longer have Grandfather’s guidance in the way He has come to teach us – do you feel that you will be able to receive the Guidance directly? Deanna: What I hear every single day is, “I am always with you”. Grandfather says that. I hear that every day. I feel confident that we are going to fall off the wagon and make mistakes, and that we are going to learn and get back on and hear what the right way is. Grandfather has not been here in 3 years and we have been moving along quite well, I think. We have made good decisions. Chris: I’ve had moments of worry about what would happen when this whole phenomenon disappears, the fallout and the consequences. Yet just in this conversation I feel a lot of confidence that when the community is up and running it will be a support and container for hearing the voice of Heart. Living here between land and sky, it will provide a lifestyle where I will be even more supported to hear my heart. I think I’ve never fully owned that or saw it quite like that before. ATF: Thank you for taking the time to give us an update about the Mesa Life Project. We look forward to checking back in with you in the future. On August 3, 2001 I married the Weather Beings. I became a quiatlzques (granicera) a “weather worker” in the tradition of the Nahua peoples of Mexico’s Central Highlands. Like a new bride, I felt elated, eager–and not completely sure of what I was getting into. I’d had a strong spiritual relationship with the unseen since I was a child, but my eclectic Nature Spirit/psychic/Tao/Sufi practice was no practice at all. Now, I was taking life-long vows in a copal-smoke-filled concrete room in Nepopualco, Morelos, Mexico. Two days before, I’d met Don Lucio Campos de Elizade, a Nahua Caporal Mayor (Major Weather Worker) in this same place–his altar room and healing consultorio. He told our small group an amazing story–as a young man he’d been hit by lightning that put him in a coma for three years. He spent that time in the heavens, where he developed deep relationships with Santa Barbarita (patron saint of Nahua weather workers and “captain” of the Weather Beings), the Cloud People, the Seed People and the guiding deities of many other weather forces. He described his time there as full of love, generosity and abundance. He spoke slowly and in Spanish. I was spellbound by the translation but even more moved by his presence. He was old and weathered and grounded like an ancient mountain. The room was alternately quiet and full of laughter, and when he spoke his worn, warm voice seemed to open a connection to something timeless. Outside of these walls, his world appeared completely unfamiliar to me, dirt poor and wildly unhygienic. But something about his presence felt familiar, comforting, solid. But on the day of the ceremony, as I stood before his altar to accept the crown of initiation, I could not shake the feeling that I was stepping into something vast and unknown. I was taking on developing a personal relationship with the Weather Beings; to offer Them the tremendous gratitude They deserve for the gifts of rain; to protect my community by interceding with Them during damaging storms; to petition for beneficial weather during times of drought; and to communicate Their living presence to a secular, mechanized culture in great need of spiritual awakening and environmental balance. I felt so small. The sky above me, populated by families of Cloud People, swirling with storms, circling the globe, seemed impossibly huge. Was I really ready for this? 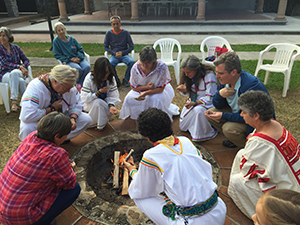 Unlike other spiritual traditions, where one studies and apprentices over years as preparation for initiation, one is first initiated into the Nahua Granicero tradition and then deepens one’s learning while “on the job.” This can be confronting and disorienting for new initiates, whose cultural upbringing may have little context for relating to clouds as ‘people’ and whose inexperience can create doubt and wariness: Am I doing this right? What am I really doing? Now, more than a dozen years later, I can see how the pieces of the slow cooking meld together. I know from experience that if initiates approach their work with attention, intention and devotion, they will receive exactly what they need to grow into their full capacity. It’s beautiful that being a granicero starts with initiation, because the “marriage” to the Weather Beings also encourages the Weather Beings to enliven Their relationship with the initiate. Despite Their vast, incomprehensible power and size, They’ll show up in ways that communicate our connection. This was a teaching moment for me a few years after my initiation: I was planning a trip down the California coast to for an overnight. Summer is “dry” season in California, with literally no rain for months. But for some reason, I felt compelled to put on one of my “weather” T-shirts and the special “rain” bracelets I reserve for ceremonies. Don’t ask me why, it just felt like I needed to. By the time I made it to my destination, the tiny cloud had been joined by others. That night the wind gusted, and it began to rain. I hadn’t understood why I had also carried offerings with me when I left home, but now I knew. I ceremonially thanked the rain in the traditional Nahua way. In the morning newspaper, the almanac showed a quarter inch of rain for the town, the only wet spot for hundreds of miles around. This was a learning process, but not the kind of learning one gets from books. It was a heart connection experience of listening in an intuitive way and feeling the expressions that live in the field of potential. Newly initiated graniceros may not feel much of a foundation initially. But fortunately their learning is also supported by an annual return to Mexico for Spring Ceremonies, when we renew our sacred altar items and our commitment to our Weather Being patrons at the altar of our Caporal Major. I returned to Don Lucio’s family compound every year for Spring Ceremonies until after he crossed over at the age of 99. Don Lucio had had a vision of the Nahua tradition growing beyond the boundaries of the Nahua homelands; he saw people from other countries as having the calling to work for the benefit of their communities. He knew that working with weather in a traditional way could help reawaken the “old ways” that have been lost in the industrialized lands. By the time he died, there were some 60 graniceros from five countries in his “Groupo Precioso. ” And before he died he handed responsibility for his altar to his protégé, Don David Wiley, who became Caporal Major for the group in 2008. Today, Spring Ceremonies occur at Casa Xiuhtecuhtli (Nahuatl for “House of Fire”), nestled in the sacred valley of Tepoztlan, Morelos. A new Majoria (a templo sagrado, or sacred temple) has been built on these very special grounds to house this altar and to provide space for Nahua ceremonies. The Spring Ceremonies are a potent time of reconnection and rejuvenation. The graniceros family comes together in an intricate dance of love and logistics. Months of planning play out over nearly two weeks of preparations and ceremonies. The sheer challenge and expense of travelling and pulling it all together is evidence of our devotion: our sacrifice is an active part of what we offer the gods. During these May ceremonies, weather workers focus on being present with and attuned to the gods, the tradition’s protectors and ancestors, and the sacred beings from the four directions. A highlight of the ceremonies comes when our most sacred object is decorated with fresh new lace and flowers: our altar’s cross. More than a symbolic remnant of the conquistadors’ forced conversion to Catholicism, a cross or “Mamacita Linda” (Beautiful Mother) holds a magical doorway for communication with the myriad Weather Beings: Coyolxauhqui, the Goddess of all skies who was Catholicized as Santa Barbarita; Ciuhcoatl, the fiercely fecund and nurturing Mother Earth; Quetzalcoatl, the Wind god, whose serpentine body rushes high above in a river of air; Nubes, the multitudinous Cloud children born of Tau the Sun and Great Grandmother Ocean; Tlaloc, the Rain god, whose sensitivity to emotion, intention and balance guides him as he shares his gift: the potential for rain. In his teachings, Don Lucio always told us: treat your cross with care and respect, because she is alive. And so she is. I’m uncertain of the date, but I’ll never forget the feeling. One night in my evening prayers, something just shifted. I felt her respond. I felt her open. She was aware and guiding me to listen in an entirely new, richer way. It took years of practice, years of prayers–and then, just like that, I could feel her essential presence. I’m fifteen years a weather worker, and in many ways I’m still beginning. The path is as never-ending and infinite as life itself. This walk has opened my eyes and fed my soul and spread the healing vibration of the old ways to all beings in my Salish Sea homelands. The work continues. By making a commitment–and by taking that commitment seriously, even in times of frustration, I’ve “forced” myself to be patient. It’s this patience that is required to slow down my busy human life to a pace that is in sync with the large, timeless, elemental Weather Beings, to serve Their needs and to receive Their blessings. And it’s this patience that transformed my initial “faith” in the path into an unshakable “knowing” that’s founded on the accumulated experience of living in reciprocity and relationship with Them. Christine Staub (North Carolina, USA SFC firekeeper) conducted the following interview for ATF. Lucy and Michael tend their hearth near Church Stretton, Shropshire County, Great Britain. Christine (CS): Hi Lucy. Hi Michael. It is so wonderful to get to talk to you. In fact, I’m really enjoying doing these interviews for the “Meet a Firekeeper” feature in Around the Fire. It is fascinating to hear about the different parts of the world where SFC hamlets have been established, the Nature and the people of those places, and especially how the various firekeepers have found their way to this work. Lucy, I remember when we first met in Portland, Oregon at the inaugural “Dancing with Emotions” training led by the Process Work Institute for SFC firekeepers. I’ll never forget my mother and I waiting for your late arrival at the airport and your brilliant smile, which I see on your face again right now! CS: That’s it! That is when I was initiated also. So, I don’t really know my way around the U.K. Can you paint a picture for us about the place where your hearth is? Lucy: Well, we live just outside of a small town called Church Stretton. This lies in the county of Shropshire, along the border with Wales. We are at the foot of an ancient hill, the Long Mynd, which is an old English-Welsh word for “hill”! It is a really amazing beautiful wild place and our hearth is basically in the valley of a bowl of hills. It has a little stream running behind it and is underneath some very old silver birch trees. Lucy: We are sitting in what would have been in ancient times a very big glacial river. The hills are 560 million years old. Our hearth is in a pretty pokey (ed note: powerful) place. The natural environment is very beautiful and pretty wild. Lucy: …so we have to have an alternative arrangement for fires when there are occasional flooding rains. CS: My next question is always “what brought you to firekeeping”? Michael: I took Plant Spirit Medicine in Massachusetts 1999-2000. Eliot introduced me to the Fire, which I found peculiar to begin with. By the end of the course I was very keen to sit by the fire. CS: What brought you to Eliot and PSM? Michael: I had an experience with a plant in Spain in the Pyrenees. I was travelling on my bike on my own and ended up having a difficult experience. I asked a plant for help and got a response. It ended up being a revelation. CS: What made you go the distance to the life commitment that being a firekeeper is? Michael: It’s my life really. The things I do day by today are back-up things to being a FK and also the other stuff I’m doing with Eliot. If there is a FK meeting, I go. Everything else makes way for that. CS: Lucy, how about you, what brought you to firekeeping? Lucy: Similarly I came to PSM via Eliot’s book and that came to me during a period when I was unhappy. I had been a long-term Taichi practitioner. At a qigong weekend workshop, I was sitting having tea with some acupuncturists and they asked, “Have you read Eliot Cowan’s PSM book?” I just knew I had to read that book, without even writing the title down. There is also a good story about when I went to the local bookshop to order it. I’d ordered it and it had come in and I picked it up. Then I got a second call, “your book has come in”, and in fact a second book had arrived so I bought it also and gave it as a gift. That happened a THIRD time, and so I ended up giving away two PSM books. CS: That book is quite the calling card. I’d heard about it from someone but discounted pursuing it because I’d just ordered an expensive traditional herbalism home-study course. But when I was browsing the alternative healing section of my local bookstore, there was one lone copy of Eliot’s book and it called to me. I couldn’t read it fast enough and hated it to be finished all at the same time. I just knew I had to study with Eliot and figured I’d have to travel to Mexico. Come to find out, he was starting his first PSM class in North Carolina, just one hour from my house, that same year. Lucy: Similarly I thought, “I’m going to have to go to Mexico”, but not long after finishing the book I got a note that there was going to be a “Phenomenon of Prayer” workshop with Sherry Morgan just across the border in Wales. There were about six of us there and it was my first time making offerings (to the Fire). Something like a switch turned on. Then the first UK PSM training took place in the same spot. At one of those meetings, Gail (a PSM practitioner/acupuncturist who had come to the UK with Eliot) spoke to us about firekeeping. It was a complete no-brainer. There was no thought process in it for me, just a knowing. I have always been where I can have a fire, have always lit a fire. CS: So when where you initiated? Lucy: In Kinnersley, Herefordshire in June 2006, the first time that Grandfather (Fire) visited the UK. What it entailed later was quite a massive disruption, a flood to my house a year after my initiation. Not long after the flood I went down to Cornwall. Michael was living in a place I had had a connection with some years before. We were just friends. I thought I could come to one of his fires, which were usually pretty busy. I made this journey and it turned out it was just Michael and I at the fire. Grandfather was working in his mysterious ways! Eventually we needed to move back up here to Shropshire. We were looking for somewhere to live and this was an unusual place as the house was being sold to be demolished and rebuilt but both of us thought we could live here. Even though it was a Monday morning there was a fire burning in the garden, just by where our fire pit now is and above the fire a buzzard and a red kite (a bird of prey) were circling and calling. It’s very rare to see these two together. Anyway, we got it and have been here for two years now. CS: So what is the make-up of your community and how are you growing it? Lucy: We are in a good position geographically here so we have people who travel to our fires from North and West Wales, Nottingham and Lincolnshire in the East of England and from Yorkshire in the North. Church Stretton is a small town of maybe 4000 residents and we have a few local people who attend. Then there are others who come from nearby towns. It is quite a moveable ever changing clientele. At the last fire a week ago it was absolute pouring rain. Last week there were 12 of us under an emergency gazebo. A time before we had put up our structure and the wind took it down. So we are getting ready to build a wooden structure above our earthwork fire pit. I had a real clear vision of it when I moved here. It will be an octagon about 15-foot diameter. CS: Can you say more about the flora and fauna where you live? Lucy: Well, there is one exotic visitor who we call a firebird, a sort of Chinese pheasant – bright yellow and red. It isn’t native. It might have escaped from somewhere. It often crosses the fire pit area in the garden and seems to be like our very own personal phoenix. Michael: The house is named after the huge silver birches that are just behind the fire pit and we have a magnificent Douglas fir at the entrance to our house. CS: How are you connecting to new attendees? Lucy: I’ve done various PSM talks, and I’ll always present the fire as an option to look into the Divine nature of everything. We also play music so we have a tight network via that, but we sometimes find that people are somehow disappointed by the simplicity of the fires. People might come once but then might want something more formal and ceremonial, or they have an idea about something shamanistic and exotic. There is something that is changing now because even though we are relatively new in this area people are starting to get that we are doing this regularly, and they are starting to feel that difference. That this is not a social thing. It is a special space, a mysterious influence. Michael: I go to art class – if it comes up in the course of conversation, then yes I will make an invitation. My art teacher and his partner are regulars at our fires. Lucy: When the SFC had those new pamphlets with the beautiful images I put one up in town and it got taken down pretty quick. I think it is about conservatism. This is not a very alternative type place. Lucy: I don’t know how it is in the States. Some people around here are not thinking that they want anything new even though I know the fire isn’t new. And then out of the blue, we’ll get a call from someone who is so excited to be able to come to a fire, there’s not really a pattern to it. CS: What question should I ask? Lucy: We had a really interesting gathering of a few of the UK FK’s last weekend. We did a go-round about how the Fire had changed our lives. It was incredibly eloquent. That was around a consecrated fire pit. It was very moving to hear from each of us how important the Fire is and how it affects our whole life, how it is a priority. Very frequently I feel so grateful to have this work in my life because in these times there seems to be so much disintegration in the systems – political, educational, healthcare, etc. To have the Fire, hold the Fire, feels like an incredible honor. CS: Thank you Lucy and Michael. This has, as expected, been a delight talking with you and I certainly hope I can come sit at your hearth some time sooner than later. • who embodies their unique place as a gift to their people. One of the crises of the times we are living through is that true adulthood, what has been called soulful psychological maturity, is actually uncommon. Too often people reach their adult years having missed the development into a fully human adult as nature has designed it. As a result they may end up arrested adolescents at 50, never maturing into the elders they were meant to become. They find themselves hindered in their contribution to their families and society. Relationships, childrearing, education, business, politics, and even spiritual connection suffer the consequences. We all know we are in a time of great transformation on this earth, a time of danger and opportunity. Thomas Berry says that these times call for a “comprehensive change in consciousness”. The world desperately needs adults who are living from a place of connection, creativity, and inspired action. How do we get there? Few outside the surviving healthy indigenous communities has personal involvement within a sustainable culture that has known the ways of nature-centered childrearing, initiation, mentoring and eldership over generations. We don’t have the LIVED experience. But we do have a vision. And we are asking that we take on this vision as a community. No one of us can do this alone nor one hamlet, path group, or even the volunteer leadership of our larger community organization. It is going to take a movement by all of us together. Hamlet by hamlet, individuals bringing themselves to their communities and working together to create a new way of living—to reestablish an ancient yet wise and practical perspective on living. Nature has designed us to move through the cycles of our life development supported at each stage by family and community so that we learn the lessons, meet the many challenges, and offer the gifts of each stage, which prepares us for the next. All too often in our modern world the natural stages are interrupted, suppressed or hyper-charged and we miss out on rich, soulful, nature-centered development. Imagine living in a way where children have plenty of time and space for wonder and innocence, time to imaginatively play and explore nature, not being pushed into growing beyond their years or experiencing trauma in their families that disturbs the very core of their being. Imagine adolescents being well supported in exploring beyond the focus on their family to investigate peer relationships and beginning to create an authentic social presence. Where young people receive powerful initiatory experiences and skillful mentoring, and adults have the juice of family, intimate relationship, friends, colleagues, and community to support their life purpose and mature toward elderhood. Where older people are able to take their seat as leaders and vision holders for the community instead of being “put out to pasture” as too old to contribute any longer. Imagine a world where it’s normal for people to have meaning and purpose in their lives and feel at home in the world. Grandfather calls this way of living Life Cycle Living. Life is cyclic. It’s unavoidable. That’s how the world works. And there are great benefits to understanding how to move with this in a way that can dramatically improve our mental, physical, emotional and spiritual wellbeing. Life Cycle Living is a way of synchronizing our being so that our energy, our growth, our connectedness, our entire being is moving with the seasons of nature. In this way we are supported by life rather than fighting it. 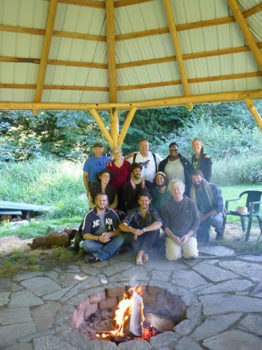 The Lifeways programs that the Sacred Fire Community has offered in the past have been a movement in this direction, and now Grandfather is blowing the doors open – encouraging us to broaden the context of this work so that we more fully explore how to live life day by day, season by season, life stage by life stage, to create a sustainable way of living that will allow our people to meet the crises of our time – and thrive. We will need to discover and create this together. Many of us know it in our bones but our culture has not provided the “how” or the support to make it a reality. First, we are developing a short, introductory program, which Lifeways providers will bring to the hamlets to give people a place to open to this awareness and begin the deep contemplations and discussions that will make this a reality. This should spark interest and dialogue with the hamlets, and give rise to groups interested in exploring the aspects of a particular life cycle, and the overall cycle of life itself. Second, we are providing further training to the men and women who hold gender fires to incorporate an awareness of this Life Cycle Living perspective into what they do, so that they can hold a space at their fires where all the men and women of the community can get in on the conversation. Finally, we will create a space for holding community forums focused on cycles of life and work with interested people throughout the larger community to bring the learning from their local hamlets and groups to the awareness of all the community. We are going to need our young people to bring their dreams, and their passionate energy, their visions for the future. Adults – some who have had initiation through a healing path or other means – will need to offer their creativity, focus on family, leadership and accomplishment of meaningful work through inspired action. We need our older adults to offer their wisdom from a perspective of caring for the whole. And of course we will be inspired by the innocence and joy of the children. We all need to move into action together. As I sit writing on February 2nd – the ancient festival day of Imbolc, or Candlemas – I’m aware of being halfway now between Winter Solstice and spring equinox, aware of the longer days, fronds of narcissus beginning to shoot up through the earth, a hawk calling in the distance. The cycles of nature are always present within and around us but the cultural perspective in which most of us were brought up ignores that our lives also are cyclic. The vision of Life Cycle Living will help us actualize a world where we are deeply connected to the community of nature and humanity, where we are supported in growing and maturing naturally – throughout our lives – so that the web of life that spans generations is maintained and flourishes. In fact, it may be that creating communities in which we support each other in doing just this is what Nature is calling forth at this planetary moment in order for us to survive through to the 7th generation and beyond. It’s a long game, but one that we all share a deep calling to embark upon. Sherry Boatright is a SFC Firekeeper in Carrollton, Georgia, USA. She is also Director of Lifeways Programs on the SFC Community Service Team. 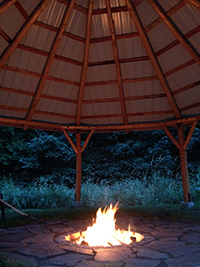 I was first asked if I’d like to contribute something to Around the Fire while attending Ancient Wisdom Rising 2015. Of course I said yes and I brought it back to Seattle, where Jimmy, Liz, and I bounced around ideas for an article. We three young adults had become great friends in the preceding year and I wanted to do something about all of us, a piece that would show just how much fun we have together. (Shoutout to Chloe Brown, the fourth member of our group, though she was not able to be a part of our video.) I wanted to speak about friendship and good times and how we support each other as we travel along, yet I was at a loss for how to do that in an article. I think it was Jimmy who first jokingly suggested making a video. We laughed and spent a few minutes talking about all the ridiculous videos we could make, like a cross-dressing dance party or imitating some of the better-known SFC folks. Although it was said in jest, I thought the idea of a video was perfect. A written piece is great but it’s hard to capture the intricacies of interaction in word, like how canned jokes are funny but they can’t replace the spontaneous laughter that exists among good friends. And so these videos were born. The first one is just us having fun together, laughing and joking with each other. It is our way to spread the joy and we hope it puts a smile on your face. The second video is us going deeper into the blessing we receive from the fire and from each other. It speaks to how our time together around Fire shapes how we walk in the world. We hope you will take the time to watch both clips AND to please let us know what you think about them. Would you like to see more of them in the future or no thanks? It’s an experiment, so your feedback is important! Join us as we venture out of our daily lives and immerse ourselves in a unique and stunning landscape so we can disconnect from our minds and reconnect with the energy and strength that is our masculinity. Surround yourself with other men as we sit by the fire and restore ourselves from the damages inflicted by the “daily grind”. 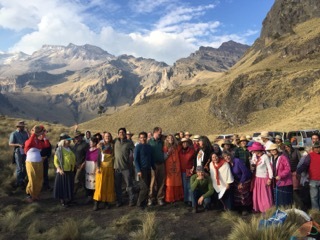 The program is led by David Wiley, an elder shaman from the Huichol Indian tradition of the northwestern Sierra Madre of Mexico and a weather shaman and healer in the Nahua Indian tradition of the highlands of central Mexico. David will guide us through physical, emotional, mental and spiritual activities so we can rediscover and deepen who we are. 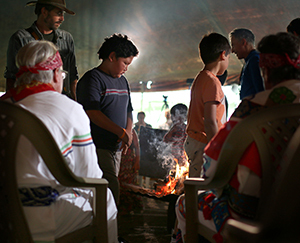 This rite of passage is led by elders of the Sacred Fire Community. They are trained and experienced in holding a container for people of western culture while honoring the deep ancestral connections that bring forth transformation. Initiation 2016 application deadline is March 1. Contact Jessica de la O at sacredemergence@gmail.com for more information and to receive an application. Find out more about this rite of passage. The fire crackles and burns brighter as one of us places another piece of wood into the center. The flame in our hearts does the same as we express ourselves, placing our fears and joys into the circle and igniting a flame of a different kind. 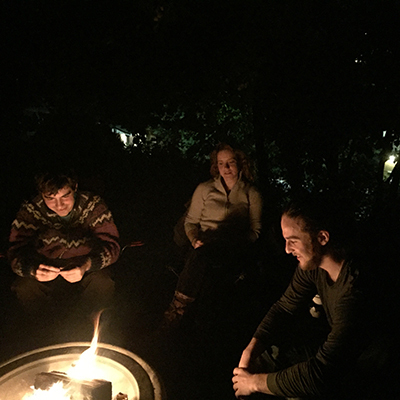 The young men and women sitting around the fire laugh as another “so bad it’s good” joke is shared. As we talk, the words move with a joyful ease, like a conversation between old friends, flowing between stillness and movement as we all take our turns listening and sharing. The topics ebb and flow and the emotions move with it. Blissful tears are shed, as a young woman with her guitar serenades us. Her voice, already beautiful, is sweetened by the courage she displays in sharing it. Powerful words of anger arise, as one of us gives voice to pain, the wound inflicted by another sitting around the fire. The expression becomes at once more essential and more difficult and listening to it is almost as hard. But after those tense moments of conflict die down, we still sit with each other, somehow feeling closer than we were before. And the river of conversation flows again. There is no destination we aim for, nothing we are looking to attain, simply content with enjoying the companionship and love that the circle exudes. We put more wood on the fire. And so goes another night at Ritaka. Ritaka is a summer gathering of young people. We camp together for a weekend as a way to deepen our connection to and learn from each other. But while the attendees may be young people, the gathering is connected to and made possible by many others in the Sacred Fire Community. The person that allows us to use their land. The initiated firekeeper who holds the space for us and keeps us safe. The kind souls that cook food for us. Those that share the invitation with their younger friends. Those that donate money so less financially able young people can attend. And those that hold us in their prayers. These people and many more make Ritaka possible. As we come upon 2016, our 6th year of Ritaka, please consider spreading the word about this lovely event. If you are a young person who wants to be given updates on Ritaka or just someone who wants more information or to help in some way please feel free to contact me at colinlenhart88@gmail.com I would be happy to talk with you. Casa Xiuhtecuhtli in Tepoztlan, Mexico is a sacred home for Nahua and Huichol medicine path groups who dedicate their lives to maintain these traditions. 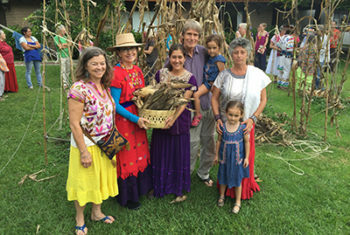 This spring, representatives from these two medicine groups along with those from four additional groups: the Blue Deer Center, the Sacred Fire Community Organization, the Sacred Fire Foundation and the local Tepoztlan Fire Community, collaborated in the second annual cycle of a prosperity ritual that involved planting, growing, and harvesting corn at Casa Xiuhtecuhtli. As the local SFC firekeepers in Tepoztlan, Ana Cortés, Jaime Vélez and I had the privilege of participating in just about every aspect of the cycle of the Prosperity Ritual: from the meetings that started months ahead of the actual cycle itself to the Planting Ritual in May, from care of the Corn during the summer to the celebratory Harvest Ceremony which took place October 27, 2015. There were teachings, delights and challenges for us at every step. A fundamental discovery was how embarrassingly clueless we modern people are in general, the three of us in particular, about how to care for a crop as ubiquitous and familiar as corn which is said to have appeared on the planet for the first time in precisely this area. There were other challenges involved here as well: ritual and practical requirements sometimes appeared to directly contradict each other. Moreover, the team working to make all of this happen was spread over several time zones and cultures so that coordinating conference calls, much less coming to a shared understanding of what to do next, was often complex. Step by step we moved together through this delicate, multifaceted dance. First there was the inspiring planting in the spring. We were pleased that so many people from our local community participated in this new endeavor. Over the summer, which is our rainy season, a local team led by Jaime and Carlos Romero watched over and cared for the corn, conferring constantly with farmers from our town. We discovered the profound storehouse of complex and again often contradictory knowledge held by the people who have been doing this for millennia, as well as their generosity in sharing that knowledge. There were tense moments early in the season when the Casa Xiuhtecuhtli cats decided that the newly cleared land was our gift of a magnificent new cat box and actually tore up some of the tiny seedlings. Then pests attacked, and we found ourselves obliged to use a chemical treatment when none of the organic methods, including picking the bugs out by hand, was working. In September strong winds came, and Jaime and Carlos ran ropes around the whole milpa (corn field) and tied the smaller, more fragile Mohawk corn to the thick, stable local corn stalks that already towered above them. By the end of the season we were even tying up tiny Mohawk cobs individually to keep them from falling off their stalks. One of the conundrums the team faced for months was how to choose the harvest day. As instructed by Grandfather[i] we had planted Mohawk corn harvested in last year’s ritual in Los Angeles alongside local ¨choclo¨ corn. Ritual demanded that all be harvested on a full moon sometime after August but the Mohawk is adapted to a short (Northern) growing season while in our subtropical climate the criollo variety has the luxury of growing tall, sturdy stalks and ripening slowly. The Mohawk, once ripe, could rot if left too long in the milpa (cornfield). 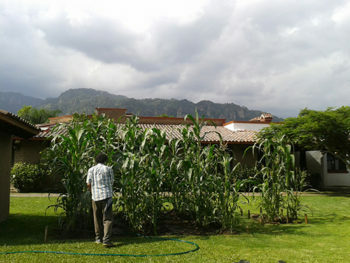 Local farmers know that some of their corn each year will be lost to pests and rot but they tend to have very big plots. 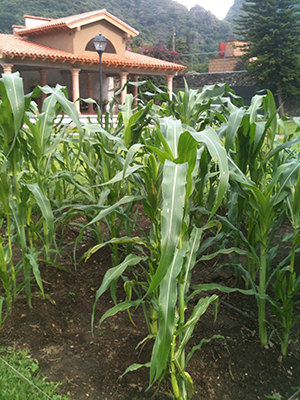 Since our milpas were small we didn`t expect to have a lot of corn so we could not afford to lose much. He helped us to understand that our milpas mirror our community. Like us, they hold the influence of different climates, cultures, histories, and in the human case, perspectives. Gradually we began to glimpse what the Gods had set up for us. Mind, caught in the customary dance of fear, was trying to ¨get it right¨. But the whole situation demanded that we weave together many unpredictable cycles and elements way beyond the linear capacity for analysis of mind. None of us had all the pieces of the puzzle and we needed to lean on each other, and trust in the fruits of our diversity and the complexity of the situation, rather than seeing it as a problem to be solved. Just as the fragile Mohawk corn was leaning on the sturdy criollo, we needed to lean on each other, trusting that something new was being brought forth, something that didn`t look like either of the two original strains, from North and South, and something no one could ´get right´. When the day of the harvest finally arrived, David led us in a simple ceremony, rich with the presence of the representatives from each of the three organizations, two healing paths and our local community. We stood in the new Nahuatl temple while David explained the ritual we would perform, translated phrase by phrase into Spanish. 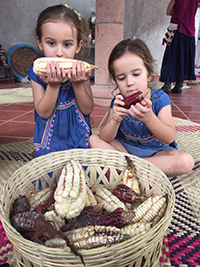 Then we walked ceremonially around Casa Xiuhtecuhtli to the milpa, picked the corn, and set about shucking, counting and separating, following Grandfather’s original instructions: one third to be eaten, one third to be shared, one third to be saved for the next planting. It was thrilling to pull back the husks one after the other and discover that we actually had a great abundance of very healthy and beautiful corn. There were oohs and aahs in both languages, from 6 year olds and grandparents alike, and people moving back and forth around the temple to admire the different quantities, colors and shapes revealed. We discovered everything from miniature, blood red Mohawk to the large yellow criollo, as well as hybrids of all sizes with surprising combinations of pink, dark blue, white, and beige. We adjourned to Ana´s house with instructions on how to roast and grind the corn to make pinole, a delicious and simple local treat, and that turned out to be another steep learning curve. It was all sorted out eventually, in two languages with multicultural interpretations and inspirations. The result was delicious! Then we returned to Casa Xiuhtecuhtli to feast on the corn alongside a potluck of wonderful dishes and to share our impressions of the day. For months I had wondered, ¨What is prosperity to the Gods? What is it that they want us to see?¨ And there we were, in all of our cross-pollinated diversity, being it. We are deeply grateful to the wisdom of Keiko Cronin, who started this whole mad scramble with her question about abundance to Grandfather Fire several years ago, thus unwittingly becoming the godmother of the whole process. Also for the patience and persistence of Lisa Lichtig, who coordinated the subtle, many faceted dance from beginning to end, and for the wholehearted cooperation of each of the team members and our local community. And our heartfelt thanks to Grandfather for guiding us back to the truly abundant ways of living known to our ancestors. [i] Referred to here is Grandfather Fire. For more information about this special way of our community receives Guidance, read here. Christine Staub, SFC Firekeeper from Greensboro, NC, conducted the interview for us. ATF recently caught up with Peter and Sharon Brown, SFC Firekeepers in Olympia, Washington, U.S.A. Peter was initiated in 2004 (part of the first group of firekeepers). Sharon followed suit in 2005. The Browns moved from Santa Cruz, CA in 2008 after searching for the right place to establish their hearth. They were attracted to the Pacific Northwest by the abundance, a particular culture grounded in working with the land and a strong indigenous presence, along with plenty of water. ATF: Peter and Sharon, would you share something about what led you to step up as SFC firekeepers? It’s no small decision, after all, as it demands a lifetime commitment, ideally to a particular community, a particular place in the world. Peter: For me the journey began with studying Plant Spirit Medicine with Eliot Cowan in the 90s which led me to being initiated as a Marakame (shaman) in the Wirarika (Huichol) tradition. Fire is central to the Wirarika tradition. The offerings, that we as firekeepers use are given to us by the Huichol people. As part of my apprenticeship there were many days and nights around the fire. I had a personal experience of my heart opening, of transformation, of seeing things coming into my life. I knew I wanted to understand how to work with this energy of fire in community settings, in a traditional manner. Like most firekeepers, I didn’t really know what I was getting into. This work, this commitment is not in the norm of western culture. What it means to be a SFC firekeeper is still evolving for me. What I can say is that Fire has really touched and transformed me, and I continue to grow with fire and work with the teachings. Sharon: In my case, I was working on a special project in Mexico in 2001 and Fire was central to that. I went on pilgrimage for a few years with the Huichols, and there was a lot of learning from Fire. Pilgrimages are so intently focused and so much deep work is done there. I found myself wanting to bring at least a taste of that to other people. To be honest, one of my challenges as a firekeeper, something I struggle with, is only being able to provide a taste, worrying it may not touch people deeply enough. I admit I need to foster patience sitting with that, allowing this work to unfold in its own time. ATF: To pick up on Sharon’s use of the word “taste”, we understand that the nature of the place you call home and where your hearth sits actually imparts some of the special “flavor” of each fire keeper’s particular community. Would you both please share something about the Land where you live? Peter: Olympia is located at the southernmost portion of the Salish Sea (formerly called the Puget Sound). The Pacific Ocean is a short distance to the West and Mt. Rainier to the East, Mt St. Helens to the South and Mt. Baker to the North. It was a couple months after we came to live here before Mt. Rainier, which fills the Eastern skyline, finally appeared from behind perennial clouds. This is when it really clicked for me that this Mountain was a big part of why we had been called here. There is something about the waters here. There is no place I’ve lived that is as abundant as this land, and I’ve lived all over this country. You don’t have to tend anything here. There is so much plant, animal and fish life. Peter: Blackberries are very distinctive here. Anywhere that sun may fall, blackberries will take over. As a medicine, as an energy, blackberries are about community. The way that they are so intertwined and almost jungle like, brings about a primal aspect of life and living. It is in a similar vein to the bees that live on our land. The bees bring about connection and cross-pollination of life and not just in the western perspective of moving pollen from one plant to the next. It is much more profound and ephemeral. The blackberries are a physical manifestation of this community while the bees are a spiritual manifestation of community. Sharon: In looking for where to establish our SFC hearth, Peter and I wanted to have enough land to create a community gathering place, more than for just the monthly community fires. We have about 10 acres, and there is a 40-acre buffer of undeveloped, environmentally protected land next door with a creek that runs all the way to the Salish Sea. We are just 2 miles from town, but the land feels like we are out in the countryside. ATF: Regarding your dream of creating a gathering place for community, we’ve heard that you recently completed a new Fire Structure over your hearth. Can you tell us more about that? Sharon: There are so many wonderful things to say about this project, because it is about so much more than the finished product. It shows the way that we are, bit by bit, making connections with people in the larger community. 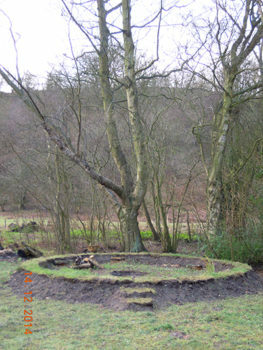 This in turn provides a natural opportunity to extend an invitation to join us by the fire. 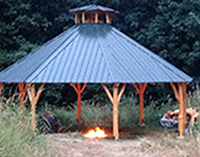 The Fire Structure is an open-sided, 26-foot diameter octagon. The proportions feel really good. It makes you feel amazing to sit inside. It was built as an internship project in cooperation with nearby Evergreen State College. While our consultant was Joseph Becker, who is very well known for his natural, mostly cob structures, it was really Tanner Milliern, a recent College graduate, who guided all the work. At 24 years old, this was his first major building project. Peter: Tanner brought such an incredibly supportive, empowering manner with how he worked with the volunteer crew. He was integral in helping to design it all. It was not part of our original intention to help to empower a young person, but allowing Tanner to step forward and be responsible, mistakes and all, was a wonderful thing to be part of. About 40-50 Douglas fir trees were chosen from a sustainable forest nearby that required thinning. The interns hand-harvested these after offering gifts of tobacco, brought them down the hill on their shoulders over a weekend in the woods. After the poles arrived on the land, we hand-peeled each one. We had work groups throughout the 3-month construction process, coordinated by Tanner, which focused on staining, notching, erecting and roofing. ATF: Would you like say more about who is showing up at your fires these days? Peter: Well, we are newcomers to Olympia, even after 7 years in. People go back generations in this area. We came here with no connections to the community. Sharon: No one here had ever heard of the Sacred Fire Community and to show up and say “we have what you need” would be presumptuous. Peter and I each participate in groups and activities in the area, and as we get to know people, we start making invitations. For instance, I go to Tai Chi classes, belong to a drumming group, and occasionally attend a Sacred Sing at the Unity church that is very strong around here. Peter: I teach a variety of classes and workshops, give talks at the food coop, a local bookstore/herb/massage store and at the community college. I’m also on the Board of Directors of a low income credit union. There is a wide spectrum of people here. My interest tends to be more in social service/community activism, and Sharon tends more to the arts. I wait longer to invite someone who is a business person than Sharon. Once someone knows I’m a “relatively normal” person, it’s easier to set the context when I make the invitation, namely that what we are offering isn’t exactly a marshmallow roasting, beer-drinking sort of fire, nor a new agey get-in-touch-with-yourself one. Sharon: We have an average of 8-10 people at most of our fires, mostly middle-aged. We are looking at ways to tap into the vibrant 20 something community that is here because of Evergreen College. Our plan is to offer these young people what we believe is a valuable way of experiencing the world, something that they won’t find in books or on the internet. We’d love to host Ritaka, the SFC’s annual retreat by and for young adults, in the not too distant future. As initiated Graniceros (Weather Workers) in the Nahua tradition of south central Mexico, we hold an annual Harvest Festival on the land as an expression of gratitude. Peter: We are in the process of remodeling our newly acquired barn into a community space that will support additional events and activities, such as the Sacred Fire Foundation sponsored Voices of Wisdom featuring wisdom keepers and elders from authentic, living traditions. We also hope to host local speakers, drum groups and gatherings of various groups and organizations in the region. Sharon: There are 22 active tribes in Washington State. This region was not settled by Anglos until the 1850s. So many of the names and places here in Washington are indigenous in nature. There are people alive today, although they are now passing, who can remember stories from their grandparents told of the times when the white people first arrived. There is a revival of tribal cultural practices which inherently align with the Sacred Fire Community’s perspective. There are ways in which we can both support each other and we are exploring these possible relationships as we speak. ATF: Sharon and Peter, thank you so much for your time. You have painted a rich picture of your work as SFC firekeepers. Readers will want to know that your fires are held on the 1st Saturday of every month. 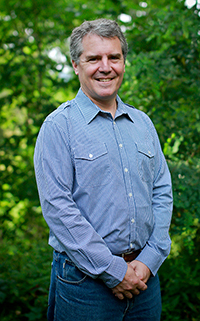 Bill Sutton accepted the role of Executive Director of the Sacred Fire Community in February 2013. He spoke to us from his home in Lakewood, Colorado as he was preparing to move to Mesa, Colorado. Christine: Bill, I’m delighted to have this opportunity to interview you. I know that many in the Sacred Fire Community (SFC) are eager to get to know you and especially to hear about what’s going on at the leadership level of the SFC . We are, after all, a rather far-flung organization, with affiliated SFC communities in North and South America, Europe and Australia. In the case of my hamlet until we hosted our first Grandfather Fire[i] in 2011 our local community members had no concept they were part of a movement that has spread (like fire!) all the way across the world in a little more than a decade. Bill: That’s perfect because I have a LOT of things I have wanted to communicate, and doing so in the context of an interview is a great opportunity. One thing I’d like the community to know from the outset is that I really appreciate and thrive on honest feedback. I even appreciate angry feedback if the situation is direct and fair. I welcome the opportunity to work things out with someone, to be genuine, to express vulnerability and discover areas of hidden blindness. An astrologer told me 30 years ago that I should find myself working for an organization, rise to the front and then I’d be in a position to learn something in this life. So this is a precious opportunity for me. C: Let’s dive right in then. How has your life’s journey prepared you for taking on the role of Executive Director at this particular point in the growth and evolution of the Sacred Fire Community? Bill: At age 17, I had some experiences that opened me to a spiritual life. I had a lot of questions. I saw that the world didn’t work at all the way I was taught or thought it did and I was asking, “What should I do with my life in this world the way it is?” I was actually wailing to the universe “Help. I need a teacher”. That teacher came in the form of Chögyam Trungpa Rinpoche. He had come from Tibet and was part of a vajrayana Buddhist lineage that traced itself to the time of the Buddha. He came to the U.S. and essentially started working with hippies and beat poets and physicists — whomever he found ground with — to structure a society known today as Shambhala. I heard him speak and read his book The Myth of Freedom, and just had to go study with him. Trungpa Rinpoche had a very large view and a very trustworthy voice. He stated the obvious, something so clear you couldn’t argue with it, very much like when we receive teachings from Grandfather Fire. A core teaching within Shambhala is related to creating enlightened society. I was very interested in looking at how that works and how government and leadership could manifest a sacred view of existence, trusting people’s nature and supporting their spiritual connection to the world, instead of just trying to manipulate and control them for fear that chaos would ensue. Anyway, I packed my bags and went to study at Naropa University, the liberal arts college Trungpa Rinpoche had founded in Boulder, Colorado. The Vajradhatu/Shambhala community, practices and projects became a close part of my life for the next 30 years. Very soon I was working within Shambhala administration on various levels and ultimately found myself working in the Office of Practice and Education. I managed very large advanced meditation/teaching programs which would last anywhere from a week to three months. For some programs we would have 50 people on staff, and a key part of the training was how to demonstrate enlightened society so that it could provide a reference point for attendees for the rest of their life. One thing I found was that if someone is in a central leadership position, and becomes the expert and tries to control things, that doesn’t work. When that person dies or moves on, what happens then? These roles (like mine as Executive Director) are not identity positions. We should not attach our longing to be meaningful in our life to a role. That feeling should be reserved for our relationship with the Divine. With that perspective we can see that we can be useful at a particular time, but eventually we will need to move on. C: Right now it is others who have moved on after offering their very meaningful contributions and it is you who has stepped in. So what is this phase of SFC growth asking of you? One of the things I often find myself doing in this life is starting things. The Sacred Fire Community arose in the mid to late 1990’s, and it has reached a stage of growth in which there are inevitable growing pains. If you ask people to tell the Story of what the SFC is, who its members are, a lot of people tell Eliot Cowan’s or David Wiley’s story, or even their own individual stories (in some way these would make great fantasy novels or adventure stories). But when we start talking about the group story, we see there has been a lot of grassroots energy and inspiration springing forth from a pandora’s box of projects that Grandfather opened up and the way he helped each person connect with their life purpose. From this, great things and great inspiration have emerged. But over time something else less visible happens — something that people naturally do but which creates a growing pain. Without realizing it, the initial adopters have congealed their “family.” They have found their place in our world and there is little room for anyone else — at least not a great influx of people to come in and find similarly meaningful roles themselves. All the positions — not administrative positions, but subtle societal positions — are taken and it seems hard to penetrate. Relationships have been formed, along with deep interpersonal knowledge. When new people move into positions, the original folks might feel, “wow, I’m just being tossed out to pasture,” that which has given my life meaning is changing.” Or they feel they can’t trust someone because they don’t yet know them. From the outside, this can look like a “good old boys” network. Most people who have been around for a while think of about 100 people when they think of the community. The fact is we are already well over 2000 people going to the various community fires, but like you mentioned earlier, most are not exposed to the larger community. And we have not developed a way to communicate who we are to the uninitiated (using the term loosely) very well yet. The fact is, we have to find a way to explain ourselves so it doesn’t narrow us down to a belief system or make us into a tradition, like “those SFC guys”, an ego in the realm of spiritual identity politics. That’s not the living experience WE have. No one is interested in that. Instead, we have to find a way to invite a much larger group of people in to find out for themselves and to feel included and needed in our reality. Before I stepped into my role there were four executive directors. I imagine that must have been a difficult structure with those four trying amongst themselves to work things out in the face of community members (meaning ALL the people who have committed themselves to supporting Grandfather’s work) each having their own expectations of what should be a priority. To some extent the squeaky wheel would get the grease. We have to remember that everybody is a volunteer, and moreover we each have come to the Fire in various ways, each with our own personal connection to the Divine, our own personal life core purpose and our own unique set of lessons that need to be learned and wounds that want to be healed. There is no membership per se. At some point our group project, which was working really great with a lot of enthusiasm, was running into some really difficult walls. The culturally inherited mistrust of those with perceived “power over” started creating rumblings and lack of cohesion. What I see is needed now is a mutual understanding that we’re less about implementing some person’s or group of people’s vision for how the world should work or how to fix it. We’re more about respecting, listening and opening to move with this sacred world the way it is and has been since the time before time. Above all we’re about learning. What we feel strongly about today, we’re open to seeing as an obsessed blindness tomorrow. This is very different than the aggression of social justice warriors or people — religious movements, utopian idealists, etc. — bound together based on a dogma or an agenda of how they will right the world. C: That’s quite a situation to step into. So what kind of authority DO you have as SFC Executive Director? C: So what are some of the priorities that you see regarding “moving things forward”? Bill: We have to find a better way to communicate who we are. It’s easy to say, “lose your mind, find your heart.” That sound bite played a key role at one point but the real message is more about mind being in service to heart than in ditching the ability to speak and think well. We need an engaging introduction to the perspectives that we are reintroducing, particularly for new people. We can’t think that by showing up to a Fire someone just magically “gets it.” Did that happen to you? For me it took several Grandfather Fires and some grizzly healing work for things to come into focus and trust/devotion to arise in my being. And after that, I still needed more healing! That’s just what it took to adjust my perspective. We have to get clear about what our unique contribution to the world is. Not just a message that says “Come to the Fire, and it’ll all be revealed” or “The sacred and interconnected nature of all life.” Yes, both of those things are true, but without deeper ways of communicating and engaging, these can sound like New Age fluff. With our messaging honed, we’ll revamp our website and materials to better represent what we’re about to people off the street, how we relate to the other Sacred Fire organizations[ii] and healing paths, and to offer a lot more connectivity. We are looking forward to creating a forum for having topical interest groups and places of exchange, and getting an economic network started where we can support each other through exchanging services. There needs to be an emphasis on helping with the fundamentals of living life. A real community is not there just to help each other through emotional crises or once a month at the fire. What creates real community is that in the same way that you commit yourself to others, they also commit themselves to you. A sense of home and anti-isolation that provides the stage where you can bring forth your divine gifts, where people want your gifts because you mean something to them and where the values of understatement and humbleness can once again be appreciated. But for it to become really real, it needs to provide support for the necessities of life and a place where your value and contribution to life itself has tangible meaning. 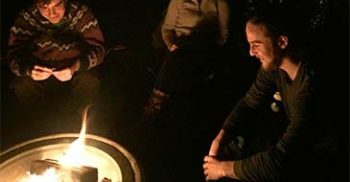 There is a comprehensive Firekeeper manual that is being worked on which will give the Firekeepers — who hold an extremely important position of being the first person new people meet — the teachings, perspectives and tools they need to feel empowered, resourceful and aligned in embodying what we are about. This is ultimately seasoning a deepened understanding within all of us so that what we say is both naturally aligned and authentic. Next we have Lifeways. The Lifeways programs, which support the journey of human life from birth to Death and Dying, are not extracurricular activities. They are core to who we are. Coming to the Fire is inseparable from opening yourself to the Life Cycle Living perspectives that Grandfather has introduced. It is about bringing Fire — heart — into our lives, which naturally opens to our unavoidable participation in the cycles of life. There are many more offerings to come in this area. The big thing we’re focusing on at the same time is putting systems in place so that we can really invite a lot more people in, and when those people come in, what they find at the entry point — be it a fire or a lifeways program — is in line with what the marketing has promised. We need to have the infrastructure in place for promotion, registration, volunteer staffing and running programs effectively. Some hamlets have worked these things out on their own; now we’re using their collective wisdom to create a common system that can support future events, which could be especially helpful in smaller communities. We also just got our 501c3 status, giving us the right legal fit for who we are. Adapting to that and the organizational shift that accompanied it (having a board, etc.) has been a big learning curve. When these things are in place, we will shift our focus to opening our doorways to many, many more people, many of whom are starving for what Grandfather has asked us to bring into the world. C: Bill, I realize I’m not really clear who else is helping hold the vision of the SFC. Bill: Well, people should know that the “generator” and guider of the vision is Grandfather. Then we have a Board with David Wiley temporarily serving as Chairman. 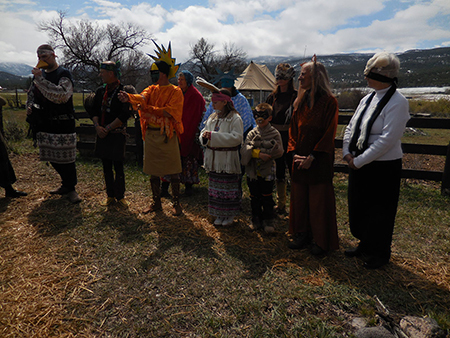 We had to plead to get him on loan from the Sacred Fire Foundation,ii since he is the repository of Grandfather’s plan for the community organization’s evolution. With his background as a management consultant, he has helped craft an interim strategic plan, which has given us a phased development process and point of focus for what we need to do over the next few years. The Leadership Guidance Group (Board) includes Susan Skinner (Treasurer), Karen Fernandez (Secretary/Development) and Roger Menadue. Then we have the Community Service Team, which comprises the directors of the core areas: Sherry Boatright (Lifeways), Annie King (Firekeeping), Dave Wiley (Outreach) and Jeff Bartlett (Central Event Coordinator). This is our structure for phase 1, which is about getting the fundaments in place. In phase 2, we’ll be focusing on greater outreach to the outside world, and we’ll adjust our team structure to reflect the expanded focus. C: Thank you for that. Bill, will you share with the readers a little bit more about yourself personally. Bill: It might surprise people that I’m actually quite shy. I have many passions, and I’m a real “generalist” when it comes to things I’ve done. I started out as a piano performance major in college and I still play piano. I love music and playing music. I played the guitar in rock bands, the first one at age 14 (the “Caped Crusaders” — and yes, we played “Batman”). I left the piano performance career when my spiritual longing took me to Naropa University where I received a degree in Buddhist Studies and Psychology. For most of my careered life I’ve been involved in publishing, writing/editing, coordination/administration, and web development — which includes a lot of things like marketing/communication and understanding systems of all kinds, such as organizational, business, and legal structures. I’m passionate about learning things, and I listen to a wide variety of podcasts — not just to learn what’s happening in the world, but even more to find out what’s being said and shaping people’s understanding of the world. It’s ironic that I use technology a lot, including in my career as a web developer, because technology so often leads people to be increasingly disconnected from personal, heart-centered interactions, and I’m clearly not a fan of that. But I am grateful for the paradox of being so totally immersed in it that I can relate to where a lot of people are stuck, and for the ability to see what’s coming over the horizon. Other things — I love to cook, all kinds of food (including salt free!). I like traveling and long to visit places on this earth like Bhutan, which is still living from an ancient wisdom perspective. And my deepest longing is to live in a community situation where people share a common deep wisdom perspective of the world. C: Thank you so much for taking almost three hours to talk with me. I find everything you have shared very inspiring. If a reader feels called to support the healthy evolution of the SFC, what would you advise to them? Who should they talk to? [i] For more information about Grandfather Fires, see here. [ii] The Sacred Fire Foundation and the Blue Deer Center are sister organizations to the Sacred Fire Community, all springing forth under the guidance of Grandfather Fire. 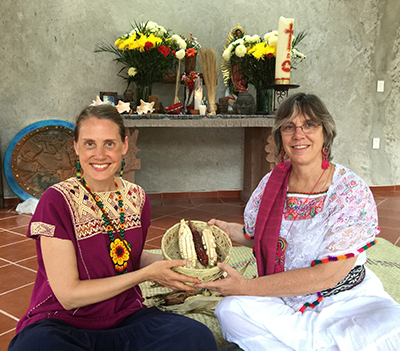 Casa Xiuhtecuhtli in Tepoztlan, Mexico is a sacred home for Nahua and Huichol medicine path groups who dedicate their lives to maintain these traditions. Through healing and ceremonial work, they seek to help humanity restore a balanced relationship with the Divine natural world. 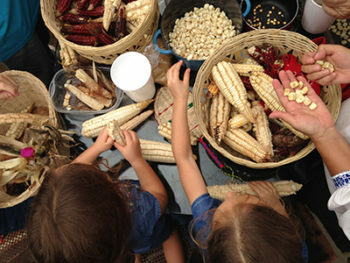 along with those from four additional groups: the Blue Deer Center, the Sacred Fire Community Organization, the Sacred Fire Foundation and the local Tepoztlan Fire Community, collaborated in a prosperity ritual that involves planting, growing, and harvesting corn at Casa Xiuhtecuhtli. 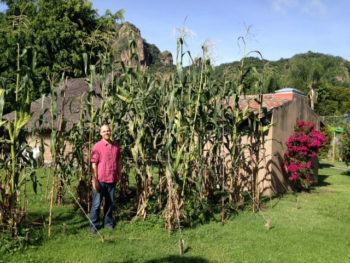 The local Tepoztlan Community under the guidance of Marakame and Firekeeper Jaime Velez, SFC Firekeepers Erica Cohen and Ana Cortez and community member Carlos Romero cared thoroughly and tenderly for two varieties of corn under sometimes challenging conditions. A number of local farmers offered their generous support and advice along the way as well. Corn has traditionally been used as the main food for many sacred ceremonies. Corn has a divine origin, a sacred essence. Its life cycle is like the human life cycle. In Mexico the different stages of human life are compared to the different stages of the corn: the corn is born very humid and cold and as it grows and ripens it turns dry and warm, like people do at an old age. In Mexico corn is made into pinole (ground and toasted corn seeds mixed with various other seeds), atole (ground corn boiled with water and sugar and cacao or fruits), tamales and tortillas. As people follow the corn’s growing season, they have many opportunities to come together to celebrate the blessings of Life and community. The corn at Casa Xiuh has matured to seed and is now ready to harvest on the October Full Moon. You are invited to participate in the Harvest and Celebratory Potluck Feast that will include some of the freshly harvested corn, on Tuesday October 27, 2015 at 2 pm at Casa Xiuhtecuhtli, Tepoztlan, Mexico. We apologize for the late notice. Please JOIN US if you can! 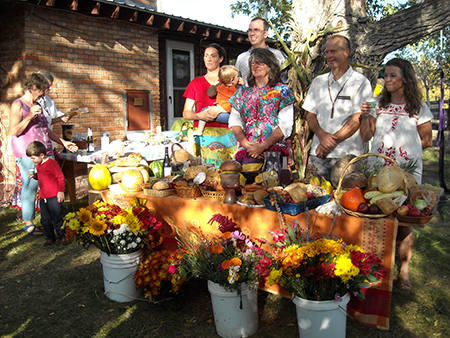 Those interested in attending the harvest celebration in person are asked to contact Ana Cortes for details. Each of the groups participating in this ritual will save some of the corn for future planting and gifting so that the cycle of prosperity may continue. The very nature of this prosperity ritual has created opportunities, raised questions, invited reflection and brought forth an abundance of experiences related to prosperity. Please complete the form below and Ana will contact you with details about attending the harvest celebration. Will Grandfather Fire reveal the illustrious Story of Chocolate? 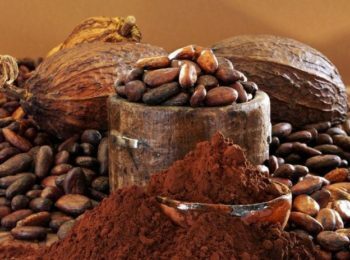 Few substances have grown to become as ubiquitous globally as chocolate has since it was taken from Mesoamerica by the Spanish conquistadors and introduced to Europe. Since that time, products containing chocolate or cacao have exploded in demand to what is nearly a $100 billion global market today! Despite its broad use, the origins of chocolate remain a mystery; with little know about its beginnings other than that it has been used in everything from sacred ceremonies, cooking and currency throughout pre-Hispanic history. 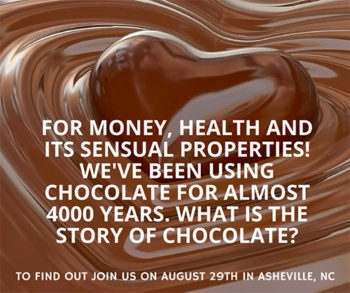 Join us Saturday, 8/29/2015 by the light of the full moon and fire as we ask Grandfather Fire to reveal the illustrious Story of Chocolate, which can only be told when conditions permit. For more information about this unique event click here. Due to the rare nature of this event, registration is being held open for the remainder of the week to make sure we can share this night with everyone wanting to attend! Registration extended to August 21, click here! Are you not able to attend the event but want to help others? • Please consider using the donation link on the registration page to give someone else the opportunity to join us. • Do you want to attend but currently lack the means to do so? Please contact us with a request as we may be able to offer financial assistance in certain cases! Contact ashevilleevents@sacredfirecommunity.org if you have further questions or requests. 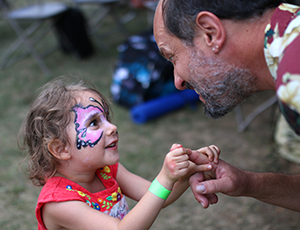 We love Asheville events and appreciate the local volunteers from this hamlet who devote their time and love to create such wonderful opportunities for us all to be with the Sacred Fire. We hope you’ll join us there! 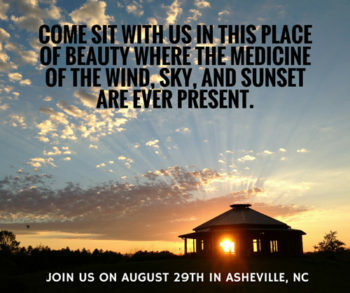 See for yourself why Asheville was chosen to host this important event! The Asheville hamlet has been hosting monthly fires for 15 years now, has hosted approximately 8 Grandfather Fires, and is the oldest consecrated hearth operating in the Sacred Fire Community. Sitting 20 minutes north of Asheville proper, the Sacred Fire Council House is surrounded by 30 acres of pastoral land and forest along the Ivy River cared for by our local firekeepers. Come sit with us in this place of beauty where the medicine of the wind, sky, earth and sun are ever present. The Asheville hearth is also home to four “marakate” (healers in the Huichol tradition) and has grown through years of experience to become a place that beckons for heartfelt gatherings like this. Register by August 15, click here! Through community, we learn that each of us comes with our arms filled with something to offer, as well as open to receive. We want to ensure this event is welcoming and affordable for families with children, young adults and those with financial need. If you are able to do so, please consider adding the donation ticket to assist those who might otherwise not be able to come to this special teaching and experience. Chocolate has long been used as an offering of love, warmth, and the bravery of spirit. 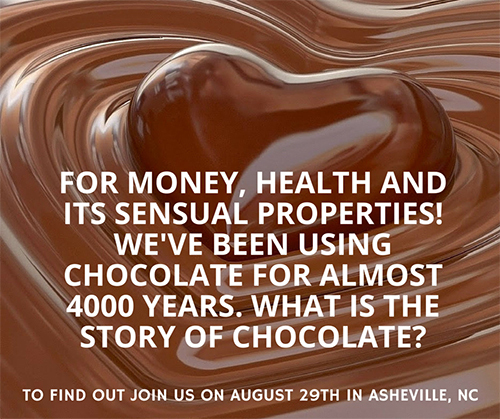 Come join us for a day of joy and connection in Asheville, North Carolina, as we explore abundance, community, and chocolate in the spaciousness of nature. The fullness of our day will meet under the full moon with the presence of Grandfather Fire. For several years now the larger Sacred Fire Community has been trying to bring the conditions together to request Grandfather Fire to tell the Sacred Story of Chocolate, which needs to be told on the auspicious evening of a full moon. With this condition in place and with his encouragement, we will be putting forth the request at this special fire in Asheville. We invite you to join us in helping to create an atmosphere of joy, connection and appreciation so that we may be granted the opportunity to hear this sacred story along with other teachings from Grandfather Fire. For hundreds of thousands of years, Fire has been central to human existence, not only providing warmth, light, and protection, but sacred space for communing with Divine. Known by many names such as the Hindu Agnideva, the Huichol Tatewarí (Grandfather Fire), the Egyptian Sekhmet, and the Greek Hephaestus the Spirit of Fire has been revered and engaged by the original traditions and peoples of our earth as a source of wisdom, compassion and transformation. What would it be like to hear and experience the voice of Fire? 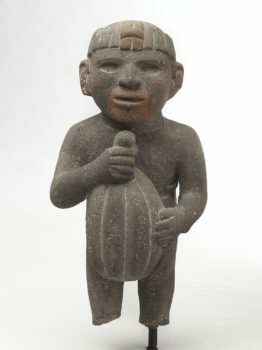 When the peoples go through difficult periods, the ancestral traditions offered a pathway for a spirit-speaking person to help their societies receive guidance and reestablish connection to the Sacred. Even in our present generations there exist respected traditions where a person is chosen by Spirit to serve in this way. The Tibetan kuten, and the Huichol axihuatakame are but two examples. In a rare occurrence, the Spirit of Fire has selected a person from outside the usual indigenous setting to serve as such a conduit for the people of our western culture, who are deeply challenged and in need of renewed connection to the Sacred. Acting as a bridge between worlds and cultures, Don David Wiley was raised in the West but called, trained, initiated and accepted as an elder in two ancestrally-related indigenous traditions – those of the Nahua and Huichol peoples. Since Grandfather Fire has appeared to provide a new, yet old voice in the world, Don David is traveling on Fire’s behalf to provide this to international audiences in Europe, Latin America, Canada, Australia and the United States. We request that you register online here by August 15, to allow us time to make final purchasing decisions for the event. Because we will be making commitments based on attendance, all sales will be final. Thank you for your help and understanding!